Government of India has not proposed to form the Tirupati- Chennai-Nellore as the tri-city industrial growth corridor. However, this region falls under the influence zone of Two Industrial Corridors namely Chennai Bengaluru Industrial Corridor (CBIC) and Vishkhapatnam-Chennai Industrial Corridor (VCIC). Initial master planning of CBIC & Comprehensive Development Plan (CDP) of VCIC have been completed. 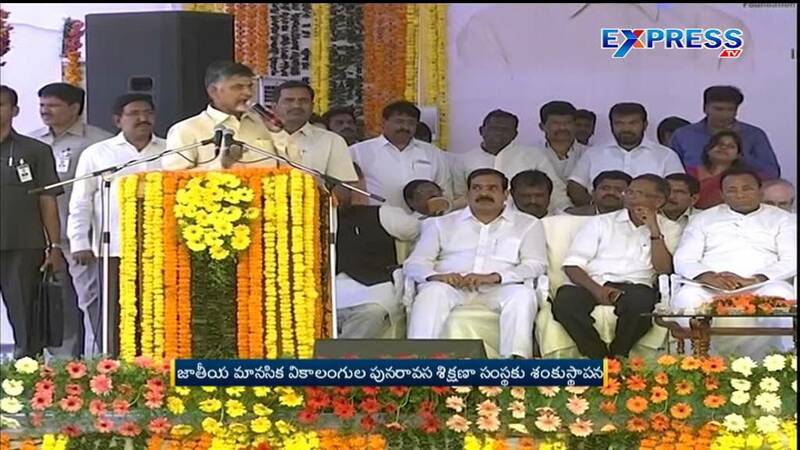 Under VCIC, Asian Development Bank (ADB), has initiated the process of Master Planning of four nodes namely Vishakhapatnam, Kakinada, Ganavaram-Kankipadu and Srikalahasti-Yerpedu in Andhra Pradesh as identified in the CDP. Delhi Mumbai Industrial Corridor Development Corporation (DMICDC) has been entrusted with the task of getting the Detailed Master Planning, Preliminary Engineering and Environment Impact Assessment of three nodes namely Ponneri(Tamil Nadu), Krishnapatnam (Andhra Pradesh) & Tumkur (Karnataka) done, for which process has been initiated. In view of the prevalence of long dry spell in cardamom growing areas of South India, Spices Board had constituted a team to assess its impact on the cardamom production. The study was done in the Idukki District of Kerala, as it produces 80% of small cardamom production of the country. As per the report of the team, the prolonged dry spell with high temperature prevailed from December 2015 to first fortnight of May 2016 and this period is the crucial period for development of tillers and panicle initiation and development in cardamom. The team estimated that on an average about 10% plant loss and 20-25% crop loss may occur in Idukki District of Kerala during 2016-17. Government through the Spices Board is implementing different programmes/schemes and providing financial assistance to the farmers for the development of cardamom. Apart from the regular schemes implemented by Spices Board for the development of cardamom, the Spices Board is also focusing on providing support to farmers through cardamom replanting scheme wherever plant loss is noticed, developing water resources through storage structures like farm ponds, wells, rain water harvesting devices, assistance for purchase of irrigation equipments and conducting the training/campaigns to educate the farmers on mulching/shade maintenance and irrigation etc. Government has approved the proposal for setting up of IT/ITES Special Economic Zones in many parts of the Country. As on date, the Board of Approval (BoA) has approved 259 proposals for setting up of SEZ relating to Information Technology/Information Technology Enabled Services (IT/ITES)/ Electronic Hardware sectors SEZs in many parts of the Country. In terms of Rule 6(2)(a) of the Special Economic Zones Rules, 2006, the letter of approval granted to a SEZ developer is valid for a period of three years within which time effective steps are to be taken by the developer to implement the approved proposal. The Board of Approval may, on an application by the developer, extend the validity period of the letter of approval. SEZ developers have sought extension of validity period of the letter of approval granted to them for the execution of their projects for various reasons including adverse business climate due to global recession, delay in approvals from statutory State Government bodies, delay in environmental clearance, lack of demand for space in SEZs, unstable fiscal incentive regime for SEZs etc. During the last four years and current financial year (upto 15th July, 2016), extension of time have been granted to 139 developers of SEZ including IT/ITES Sector across the country to complete their projects. Increase of tariff or imposition of Quantitative Restriction are measures to regulate the volume of imports of particular commodities. Technical regulations, also called mandatory standards, play a much more important role globally in checking import of poor quality goods. WTO Agreement on Technical Barriers to Trade (TBT) empowers member countries to mandate standards on goods with the objective of maintaining national security requirements; prevention of deceptive practices; protection of environment, animal or plant life or health; human health or safety. Similarly, WTO Agreement on Sanitary and Phytosanitary (SPS) Measures empowers member countries to mandate standards on goods with the objective of protecting human, animal or plant life or health. Various ministries and agencies in Government of India like Food Safety and Standards Authority of India (FSSAI), Ministry of Steel, Department of Electronics & Information Technology, etc. are pursuing these objectives and have mandated standards in the recent past. Any standard mandated by the national authority is equally applicable to domestically manufactured products as well as imported products. Also, the Department of Commerce has been organizing National Standards Conclaves to sensitize stakeholders/ministries to meet the objectives of the standards like protection of human health or safety, animal or plant life or health, the prevention of deceptive practices, national security requirements or the environment with a view to protect the interests of consumers. The central government is also pursuing the agenda with the state governments and last year, five regional standards conclaves were organized to generate awareness across the country. This information was given by the Minister of State (Independent Charge) in the Ministry of Commerce & Industry Smt. Nirmala Sitharaman in a written reply in Rajya Sabha today. Government of India has taken various steps to track the trade restrictive measures of other countries through various mechanisms such as regular interaction with trade, industry and legal experts dealing with international trade law, organizing conclaves/workshops on important issues like standards, monitoring of draft notifications of member countries, their implication, Indian Trade Portal, active feedback from Indian Embassies, etc. India’s position is that issues related to labour and environment should be dealt in the appropriate forum. India have also maintained that in the WTO negotiations first the agenda of Doha round of trade negotiations should be completed. At the WTO ministerial conference held at Nairobi in December 2015 some members wished to identify and discuss issues other than the remaining issue in the Doha Development Agenda (DDA), others – mostly developing country members - did not agree. It was agreed in Nairobi that any decision to launch negotiations multilaterally on such issues would have to be taken by consensus. This is reflected in the Nairobi Ministerial Declaration. It acknowledges the differences in views and states that any decision to launch negotiations multilaterally on any new issues would need to be agreed by all Members. The `Make in India’ initiative was launched in September, 2014 with the aims of promoting India as an important investment destination and a global hub for manufacturing, design, and innovation. Thereafter, during the period October, 2014 to May, 2016, the FDI equity inflow has increased by 46%, i.e. from US$ 42.31 billion to US$ 61.58 billion in comparison to previous 20 months (February, 2013 to September, 2014). FDI inflow has also increased by 37% from US$ 62.39 billion to US$ 85.75 billion. India has been ranked 3rd in the list of top prospective host economies for 2016-18 in the World Investment Report (WIR) 2016 of UNCTAD. To further boost the entire investment environment and to bring in foreign investments in the country, the Government is taking various measures like opening up FDI in many sectors; carrying out FDI related reforms and liberalization and improving ease of doing business in the country. Steps are being taken for development of support infrastructure to facilitate setting up of industries such as transport infrastructure, utility infrastructure etc. The Department of Industrial Policy and Promotion has advised Ministries and State Governments to simplify and rationalize the regulatory environment through business process reengineering and use of information technology. Company wise classification of the investment based on the programme is not maintained centrally. However, sector-wise details of investment received through Foreign Direct Investment (FDI) equity inflows after launch of `Make in India’ programme in September, 2014, are at Annexure-I. All figures are provisional subject to reconciliation with RBI. ^ Compared with figures of Financial Year 2012-13 i.e. US$ 34.30 billion. ANNEXURE REFERRED TO IN REPLY TO PART (c) OF THE RAJYA SABHA UNSTARRED QUESTION NO. 298 FOR ANSWER ON 20.07.2016. Till date 728 applications have been received in the Startup India portal. Out of them, 180 applications are complete and have been recognized as startups by Department of Industrial Policy and Promotion (DIPP). Only 16 applicants are incorporated after 1.04.2016 and are thus eligible for consideration for tax benefits, as per the Finance Act 2016. The applications for tax benefits are examined by the Inter-Ministerial Board. 3 applications were considered and one has been recommended for tax benefit in the 2nd Inter Ministerial Board meeting held on 28.06.2016. (vii) A panel of facilitators has been constituted to assist Startups file Intellectual Property applications. DIPP has decided to bear the facilitation cost on behalf of Startups. To avail this benefit, the certificate of eligibility from the Inter-Ministerial Board was required which has been dispensed with. Now a certificate of recognition is sufficient to avail this benefit. Startup India Action Plan envisages spreading of the Startup movement beyond the digital/technology sector to a wide array of sectors including agriculture, manufacturing, social sector, healthcare, education etc. and from existing tier 1 cities to tier 2 and 3 cities including semi-urban and rural areas. (ii) Fund of Funds: A 'fund of funds' (FFS) of INR 10,000 crores to support innovation driven Startups has been established which shall be managed by SIDBI. The fund will invest in SEBI registered Alternative Investment Funds (AIFs) which, in turn, will invest in Startups. It will act as an enabler to attract private capital in the form of equity, quasi-equity, soft loans and other risk capital for Startups. Rs. 500 crore has been released to SIDBI in FY2015-16 and Rs. 600 crore in FY2016-17. First meeting of Venture Capital Investment Committee (VCIC) was held on 12th July, 2016, wherein 13 proposals were examined for funding under FFS.